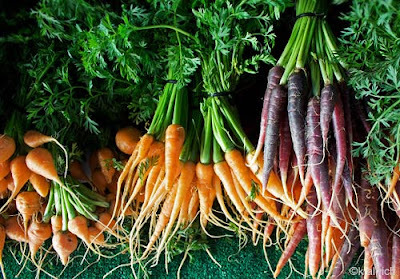 Gorgeous fresh picked carrots in a rainbow of colors. 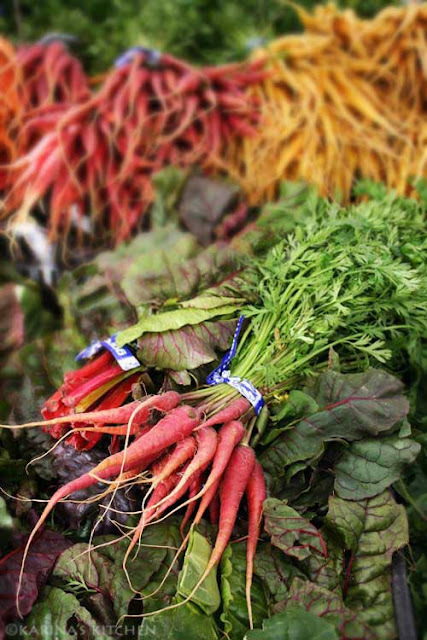 This week at the Santa Monica Farmers' Market the jewels of the season glow. Among my favorites? The rainbow carrots in orange, ruby, purple and gold. Some roots were so young they were the tiniest of crooked fingers, delicate and naturally sweet. These carrots make wonderful crudities for hummus. I love these beautiful purple and yellow carrots. Persimmons. Just the word make my lips pucker. I can almost taste the astringency just by saying it. I suppose I ought to confess I've never eaten a persimmon in my life. I am a persimmon virgin. But my pal Kalyn over at Kalyn's Kitchen has persimmon experience (she advises, "Regarding the persimmons, you must remember to get FUYU PERSIMMONS. Repeat it like a mantra, Fuyu, Fuyu. The Hachiya persimmons are astringent and taste terrible until they are ripened to the point of being soft and almost liquid, but Fuyus can be eaten like an apple at almost any stage of ripeness."). This Winter Fruit Salad Recipe with Persimmons, Pears, Grapes, and Agave-Pomegranate Vinaigrette from Kalyn sounds fresh and fabulous for the holidays. Maybe I'll be tempted to finally take a bite? The Brassicaceae family and I do not get along. So I cannot indulge in these Easter colored egg-evocative root vegetables. 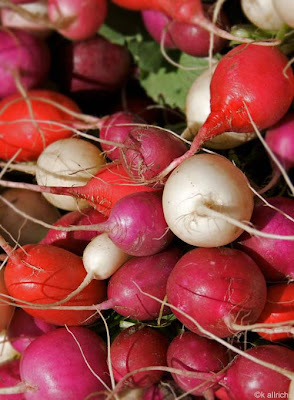 Radishes do not a happy tummy make, in this kitchen. But I can admire their globular loveliness just the same. Aren't they beautiful? Beautiful photographs. I've never had a persimmon either - let me know what it's like if you try one. I've never had a persimmon either, but they look fantastic =D. Sigh. I'm so jealous; the S.M.F.M. is my favorite!. We only get there (to California) once a year. These are beautiful - and in December! I bet living in California is great! I used to live in Santa Monica and I loved the market. I remember the mushroom guy and the beautiful family that had amazing produce. Last time I was visiting there I bought 5 pounds of the most amazing pistachios I ever tasted, I still have few ounces in the freezer. Time for another trip! Thanks for the pictures, they are beautiful. I am in love with those carrots. And you really should try persimmons! The fuyu ones are not astringent - they're mildly sweet and so tasty eaten right out of hand. Which reminds me, I need to find some...maybe a persimmon salad is what I need on my Christmas dinner table! you are such a fabulous writer&photographer! Gorgeous photos! I am seriously jealous because our market closes in October! Regarding the persimmons, you must remember to get FUYU PERSIMMONS. Repeat it like a mantra, Fuyu, Fuyu. The Hachiya persimmons are astringent and taste terrible until they are ripened to the point of being soft and almost liquid, but Fuyus can be eaten like an apple at almost any stage of ripeness. 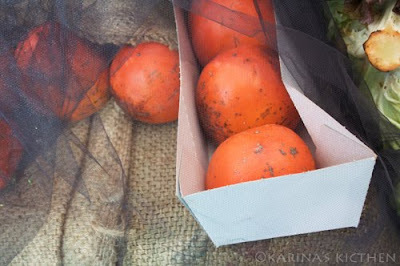 I never thought much about them until I had this big box of persimmons to experiment with, but now I love persimmons. Karina, I love persimmons and I can't wait to see any persimmon recipes you come up with, especially cakes and breads and pancakes! Here in Northern California the persimmon season is just ending and I have a huge bag of mushy persimmons to work with ... YUM. I might try adjusting your apple cake recipe ... we'll see. What beautiful "eye candy" for a foggy-cold wintery day! Brightened my day. Aside from all that I appreciate your comments on your different food sensitivites. I share all your intolerances and hearing someone else talk about them in such a light-hearted way helps me not feel like I'm the only one dealing with so many food issues. But at the end of the day it's so wonderful to eat healthy, delicious foods and stay healthy and well! I make all of your recipes. Thanks Karina and Merry Christmas! I'm green -- and orange and red and pink -- with envy. Not just at the gorgeous carrots, but at the fact that you have a farmers' market at this time of year. We have a Wintertime farmers' market in Providence, but there is very little fresh produce there. We're actually moving to Santa Monica tomorrow. I can't wait to start hitting the farmer's markets! Karina - you are one lucky gluten free goddess! A farmer's market in the winter! And persimmons - I had my first one when I traveled to Israel - right after I was diagnosed with Celiac - I bet you'll be able to find some good Middle Eastern recipes that use persimmon. Can't wait to see what you come up with! It's hard to imagine a farmer's market with those beautiful fresh veggies while we have a foot and a half of snow here (and it's still snowing! ), but I love seeing them. So glad you are back in CA and happy once again. It shows in your new photo! I am so envious! We will not have farmers' markets again until May or June. (sigh) That's the great thing about the internet - I get to live vicariously through my favorite bloggers. Thanks for posting the pics. Loved 'em. Beautiful food - and photos! Those carrots are fabulous when scrubbed (I don't bother peeling the organic ones), halved or quartered, and roasted at a super high temp...and made into carrot fries. 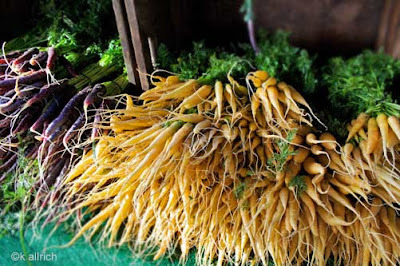 I really want to use carrots as a centerpiece instead of flowers after seeing that incredible photo... brilliant colors! Sorry Goddess, but I must respectfully disagree with your friend's advice regarding the Persimmon. Yes, the Fuyu is great because it can be eaten when still firm and can be used to cook with as well, but the Hachiya is an old variety used for making holiday goodies. Each year I make my grandmother's Persimmon Bars (which I would love for you to adapt hint, hint)which can only be made with the Hachiya. When they get super ripe and squishy you don't just have to scoop out the pulp and bake with it, cut off the top with a sharp knife and use a spoon to eat the gooey goodness inside. Might be an acquired taste, but to me, the Hachiya says: HOLIDAY TIME IS HERE!! !